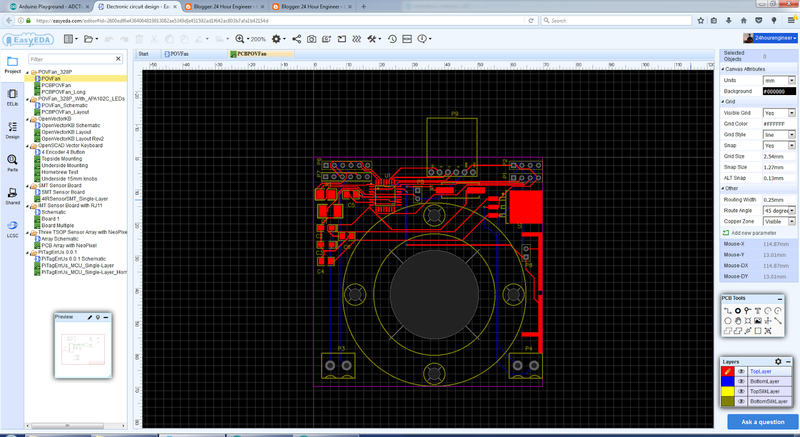 A new revision was made for the PCB layout. This size was much less expensive and allowed the decoration to be designed on a different medium such as wood or plastic. A large hole was the central feature of the PCB which was meant to hold a 61805 bearing which has a 25mm inside diameter, large enough to fit a thumb for the spinning feature. The components were kept outside a range where a 3D printed cap would go. This cap hasn't been designed but the range should be more than necessary to cover everything. Along the side, lower right corner, two pads have been added to the top and bottom which were intended to be two touch pads which can be used to change modes on the fan.